“What happened to my reader? Last year, he was in the library every week picking out books. I had to take his book away at meals. Now, I can’t get him to read anything. It’s like he has no interest in it.” This mystery baffles parents, librarians, and teachers alike. As students pass through middle school and into high school, many of them stop reading for pleasure. Loving adults beg, cajole, bargain, mandate… but nothing works. Let’s get one thing out of the way: It’s not your fault. It’s not your child’s fault, either. Major neurological changes take place during middle school years, and these developments affect the way pre-adolescents view the world. While these changes are happening internally, their lives are changing externally, too; homework demands increase significantly, athletics and other extracurricular commitments take up more and more time, and social interests become a principal focus. 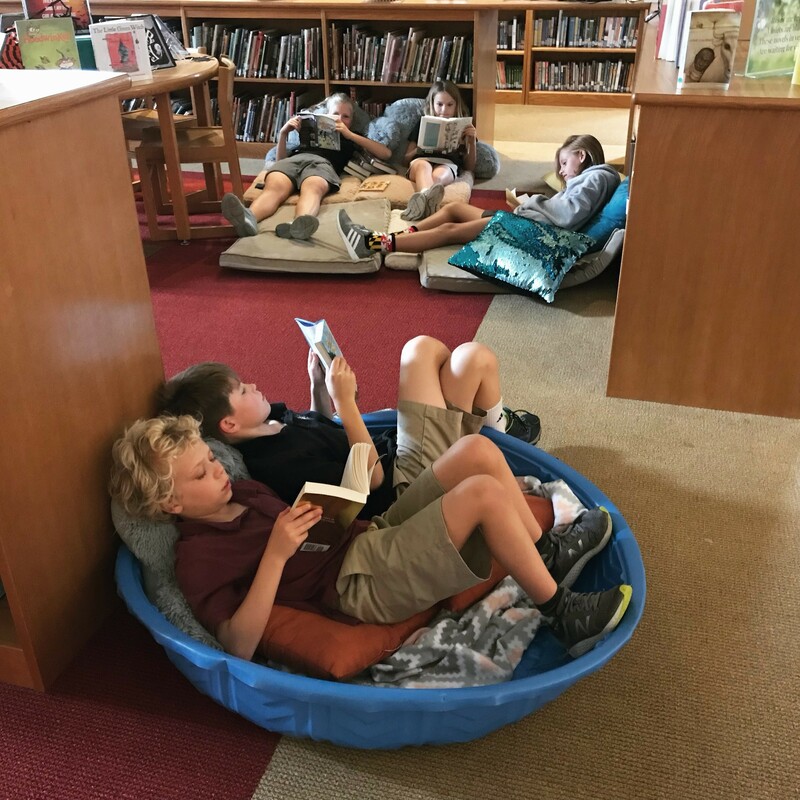 Additionally, the amount of assigned reading increases, and as students are required to read more for school, their schedules no longer provide time for reading for pleasure. As it turns out, the more children are required to read, the less they do it. Many educators refer to this as the reading slump. We have seen this transition firsthand in our classrooms and libraries. We’re here to share, after years of trial and error and stacks of research books, what has worked for us. Some of these things are unconventional, but all of them have helped our students to sustain the love of reading that they had when they were little. As we introduce students to the unique structure of our sixth grade English program, the following questions arise each fall, and provide us an opportunity to invite students to approach reading in a new way. The biggest piece of the puzzle is also the simplest: student choice. In order to preserve students’ love of reading while helping them to continue to develop their reading skills, we create a reading curriculum based on choice and surround students with quality literature of all genres and levels for independent reading. This combination encourages them to explore reading without consequence or judgement. If a student tries a book and then discovers it is not a good match, we provide the option of abandoning it. There are too many great books to slog through one that isn’t captivating. When students have independent books they enjoy, they are more invested in the process, read more closely, and grow more as readers. They also find more time in their schedules for reading and are more eager to begin their next book. It is important to note that finding an identity as a reader is a trial-and-error process that can take a lifetime and cannot develop without choice. The more students read, the more they learn about themselves as readers and the stronger their identity becomes. 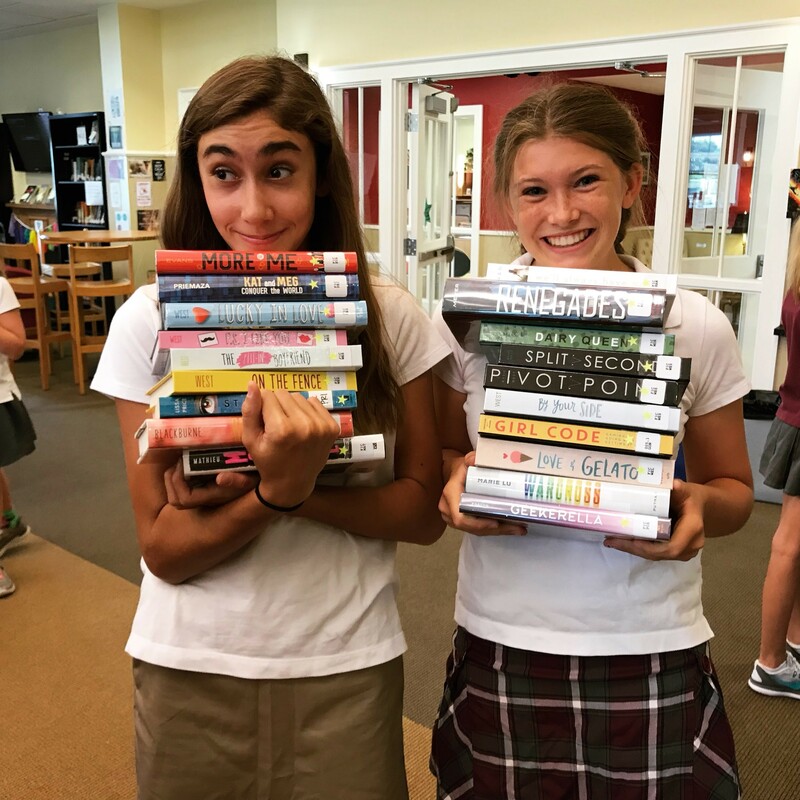 School libraries are incredibly powerful tools for providing choice and empowering students to pick books that they love. A school or classroom library should be student-centered. While adults prefer things to be neat and quiet, kids care more about having comfortable spaces, feeling welcome, and being able to find what they want. In our library, you’ll find books piled everywhere, music playing, and kids stretched out on the floor next to their shoes. It’s not always orderly, but it’s always theirs, and because of that, they love it, respect it, and spend as much time in it as possible. When we designate extended periods of time for students to pursue their interests in reading, we send a clear message to them that it is worthwhile and important. Similarly, when we take the time to read aloud to students, sharing the experience of a novel or picture book with them, we demonstrate how reading can bring them joy and help them learn at the same time. In the transitional years of middle school, correctly analyzing a classic novel often takes precedence over giving students time to explore their interests and practice widely-applicable comprehension and analysis skills. Though both approaches will help students to become more skillful readers, the former often diminishes a love of reading while the latter encourages it. We show children what matters by the time that we spend on it. 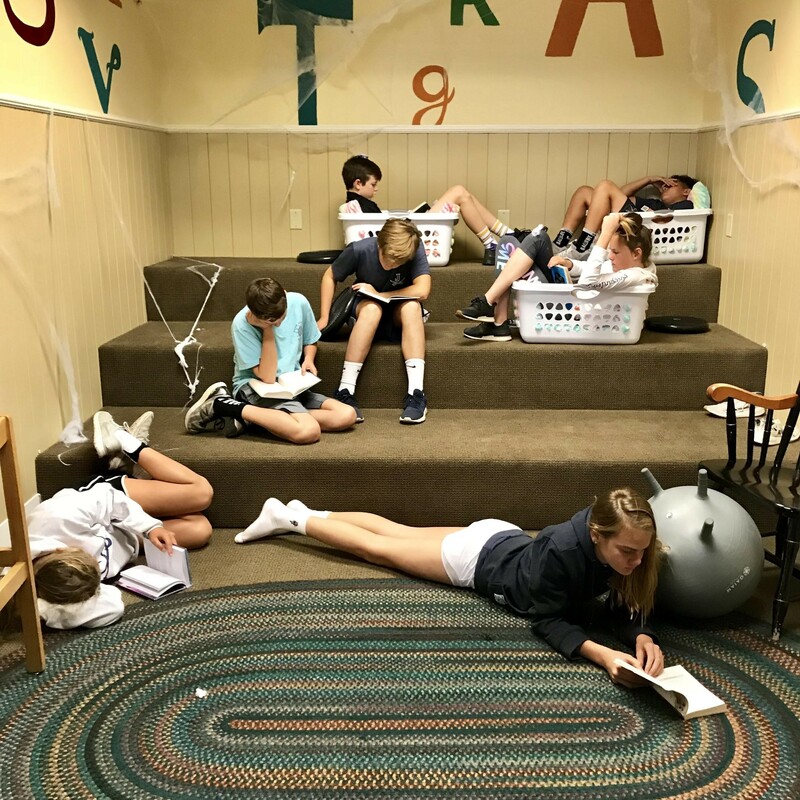 We give them a chance to practice making reading choices, and then honor those choices by carving out time during their busy days that belongs exclusively to them. It’s easy to tell students that reading is important, and that they should find time in their busy schedules to do it, but, as we all know, actions speak louder than words. Help students to set reading goals for themselves, give them time to strive for those goals, check in with them frequently, and reward them for success–with more reading. External rewards send the inaccurate and counterproductive message that reading is merely a means to an end. Earning more time to read or a trip to the library are rewards that carry the excitement and pride of finishing a book into the next reading journey. Make reading a priority in your classroom or home, and your students will do the same. Modeling a life and love of reading matters; our job when kids are reading is critical. Closing our laptops, putting down our work, and picking up a book right alongside students gives credibility to our claim that reading is valuable. This is true for all of the adults in a child’s life. Telling students to make time to read is one thing: doing it, while they’re watching, is another. It tells them that reading is such an important part of our lives that we will stop everything to do it. And they should, too. When our classrooms and libraries aren’t full of silent readers, they are bursting with passionate conversation. Talking about stories doesn’t come naturally to most students, and modeling the way that we talk about books, with excitement and enthusiasm, makes a huge difference. Going beyond plot summaries and genre descriptions to meaningful moments and emotional responses models a deep and rewarding relationship with books. As the school year progresses, we see a change in how our students talk about what they read. This leads to a change in the way they approach books, and helps to create deeper connections with literature that go beyond academics. Habits like these lay the groundwork for a lifelong love of reading. Traditionally, reading is seen a solitary activity. But teens and tweens don’t work that way–so neither should reading instruction for this age group. By adolescence, many readers have developed negative opinions about reading: it’s boring, it’s too hard, it’s not for them. By turning reading into a collaborative, interactive experience, we are able to use this mindset to our advantage as an opportunity to surprise students and reset the way they approach reading. These experiences further cement reading as an exciting, rewarding, and important part of their lives, making it something that they are more likely to continue in the future. In our library, everything centers on students’ passions, not required literature or academic expectations. 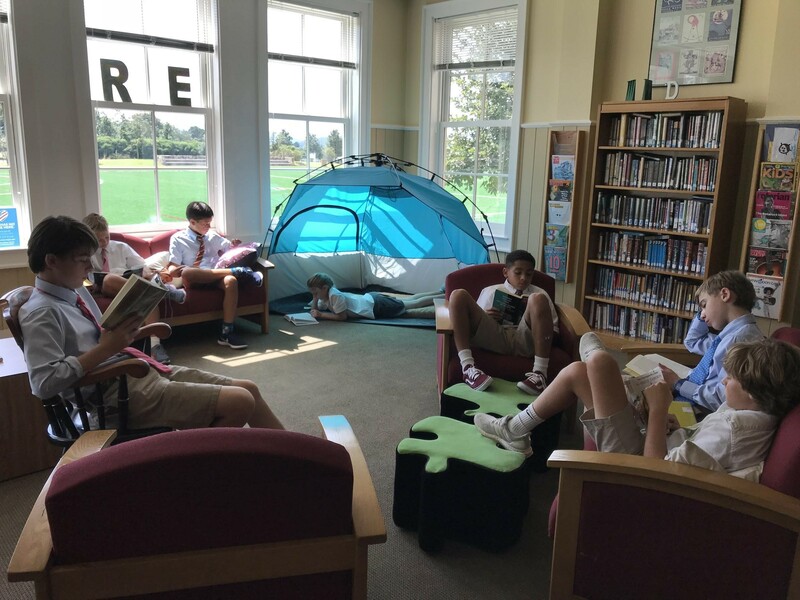 Book clubs, literary lunches, literature-themed makerspaces and computer science collaborations, and interactive artistic and written book displays get students talking, moving, and experiencing literature in an unexpected and engaging way. Suddenly, books that felt daunting or boring seem exciting, challenging, and within reach. These gatherings provide diverse opportunities for learners of all strengths to feel like they belong. A reading program that requires students to conform or sacrifice in order to succeed will not be as strong or as meaningful as a program that is created to be flexible and to reflect its students’ strengths and interests. How do students learn about new titles, upcoming events, and what books we’re reading? We tell them, even when we can’t see them in person. Part of engaging students is meeting them where they are, and there’s no denying that tweens and teens spend a lot of their time online. Instead of lamenting the lure of screens, teachers and parents can embrace social media and use it to market literature and reading in a way that adolescents will find exciting and relatable. To see this in action, head to Instagram and check out @fitzbetweentheshelves. Every student deserves to be a reader. From succeeding academically to leading a fulfilling life, a love of reading will pay meaningful dividends every day. By demonstrating the importance of making time to read and respecting students’ choices, challenges, and interests, we can help preserve their love of reading throughout their middle school years while encouraging their natural fascination with the world and nurturing their critical thinking skills. It is not always easy, it is certainly not conventional, but it is very much worth the investment. Sarah FitzHenry is weird, even for a librarian. She’s passionate about creating school libraries that make every child feel welcome, confident, and safe. 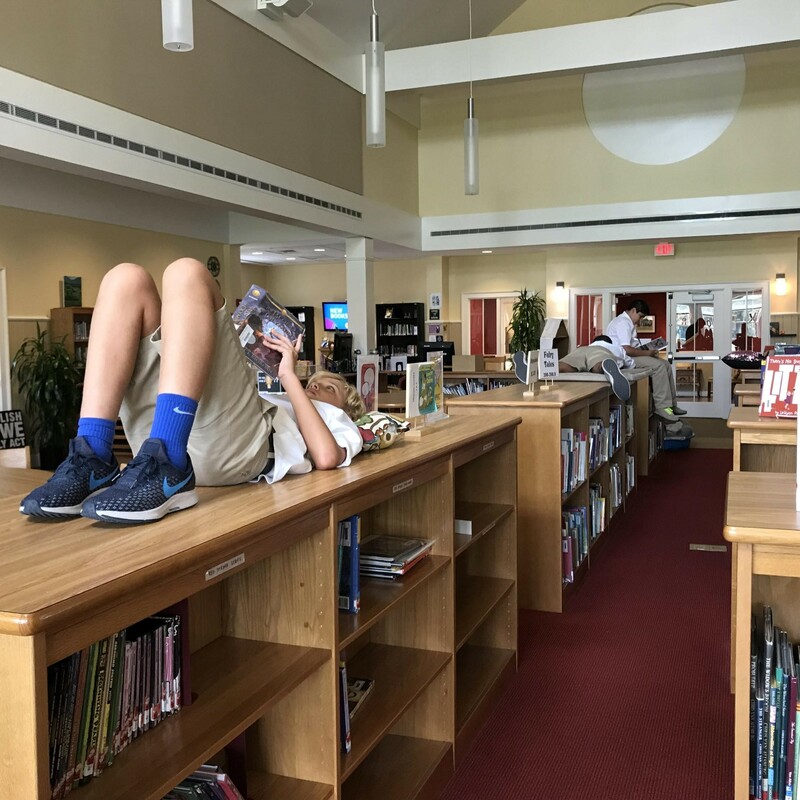 The K-8 Librarian at St. Anne’s-Belfield School in Charlottesville, VA, Sarah is the voice behind library blog Fitz Between the Shelves. She writes and speaks internationally about school libraries, technology, and the joy of being a nerd. Sarah is a proud member of Books on Bikes, robotics coach, aerial yoga instructor, and lifelong learner. Follow her adventures on Instagram @fitzbetweentheshelves and Twitter @fitzbtwenshelves. Jared Passmore is continually impressed with the depth of ideas that students express when given the time, space, and trust they need. Jared teaches sixth grade English at St. Anne’s-Belfield School, where he also coaches varsity football and middle school basketball, and is a teaching partner in the College of Education at Mary Baldwin University. He lives his life in accordance with the four fundamental truths about reading: the book is always better than the movie, there’s always time to read one more chapter, no one is too old for a read-aloud, and the next book someone picks up might just be an all-time favorite. This is everything! I had two avid readers, and the junior only reads audiobooks now. At least he has those! I wish there was more choice in the high school level English classes…even if they are given a required set to choose from, it is still a choice. Thanks for this post! This article was just what this teacher needed to hear. I teach 5th grade and some of my most passionate readers, have just stopped? I have never had a group just abandon books this quickly before. This year has been tough because the biggest thing that connected us together this year has disappeared. I am curious about the literature maker-space. Can you share a little more about this amazing idea? As a parent and an educator, I find your philosophy so inspiring! I am incredibly grateful for your creativity and leadership. How lucky that my child gets to spend time talking about books with both of you!